Matej Polomsky, MD is a board-certified surgeon performing advanced cataract and refractive surgeries as well as minimally invasive glaucoma device implantations. 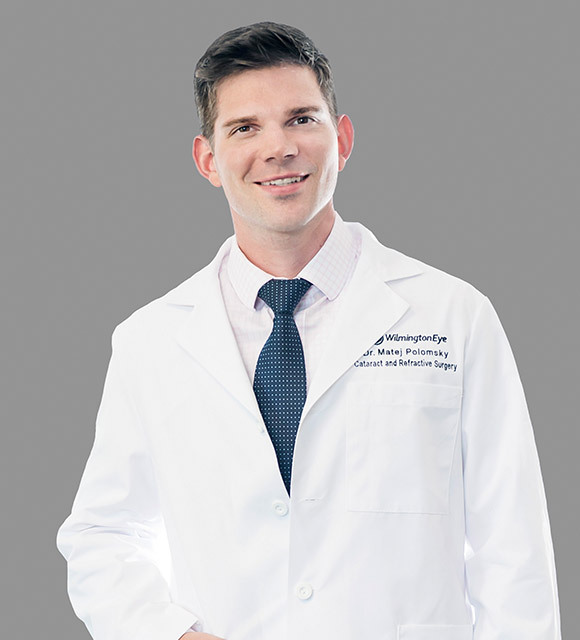 He completed his Ophthalmology residency at the University of North Carolina in Chapel Hill and his internship at Georgetown University Hospitals in Washington, D.C. After his residency, he spent some time in beautiful Boulder, Colorado and completed a laser vision correction fellowship. He has been a part Wilmington Eye since January of 2013 and sees patients in all three Wilmington Eye locations. Dr. Polomsky prides himself on delivering strong, ethical, and thorough patient care in eye disease and surgery. Dr. Polomsky is a published surgeon and recently received the prestigious 2017 ASOPRS Research Award for the research he performed while a resident at the University of North Carolina. He stays up-to-date on the latest technology and treatments by attending national conferences. At UNC, Dr. Polomsky received extensive surgical training in modern cataract removal. He performs no stitch, micro-incision surgery with minimal anesthesia using the most advanced intraocular lenses available today. He also performs blade-less cataract surgery using the LenSx Femtosecond laser technology and was the first surgeon certified in Wilmington to perform ORA-guided cataract surgery. His other certifications include VISX CustomVue S4 laser, Intralase Femtosecond laser for laser vision correction, and Glaukos iStent implantation for glaucoma. Originally from Slovakia, Dr. Polomsky moved to the greater Washington D.C. area at the age of five. He double-majored with Honors from Northwestern University. Following the completion of his undergraduate studies, he went on to receive his medical degree from New York Medical College. In his free time, Dr. Polomsky enjoys playing lead guitar and performing locally with his 90s rock & roll band called Alternative Vision. He stays physically active by running, swimming and playing tennis.